Accessories: Accompanied by Ludovic Ballouard Certificate of Origin, polishing cloth, pouch and box. A master watchmaker having worked with and for some of the greatest watchmakers of our time, such as FP Journe, Ludovic Ballouard who started creating watches under his own name in 2009 has the rare talent of making the complex look simple. The Upside Down is an entertaining alternative to the classical way of reading time. As its name implies all, but one, numerals on the dial are upside down. The 12 numerals are classically displayed on the dial but are placed on twelve rotating discs. When the central minute hand precisely reaches the 12 o'clock position, the past hour number instantaneously turns 180 degrees upside down. Simultaneously the new hour turns right side up. This disc also reveals a white dot beneath, only when turned right side up, as to make it easier for the wearer to quickly find the correct hour. The rotation of these two tiny hour disks is faster than the eye can follow, and by using Maltese crosses to control the rotation mechanisms, time-keeping precision is not affected. 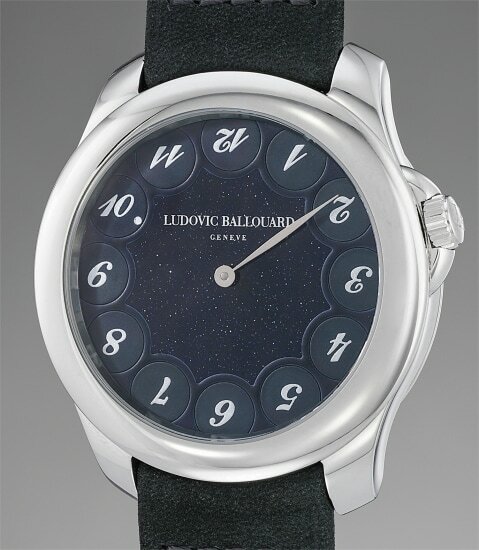 A man who enjoys a technical challenge, Ballouard did not wish to place the mechanism controlling the rotating discs under the dial, considering that the owner would appreciate seeing the complexity of the complication and watching the discs rotate, he placed the mechanism on the back. No easy task as it necessitated drilling 12 minute holes through the movement plate for the 12 tiny pinions that control the hour discs. Small yet important details on the platinum case show Ludovic Ballouard’s dedication to perfection and craftsmanship, such as the hand engraved initials on the platinum crown and side of buckle, the inscriptions on the case back have also been hand engraved. The dial on this model is made of aventurine, a form of quartz, characterised by its translucency and the presence of platy mineral inclusions that make the dial resemble a starry night sky giving the watch a theatrical and sophisticated appearance. The present watch from one of contemporary horology’s most respected craftsmen is an ode to elegance and sophistication…with a twist.